After a long wait, the first trailer for Avengers: Endgame has been released. The biggest highlight of the trailer had to be the revelation of the movie's title. Outside of the title, there were still a number of other highlights throughout the course of the trailer to keep fans on the edges of their seats, including Tony seemingly saying goodbye to Pepper Potts, Captain America's response to the "snap," the revelation of Hawkeye as Ronin, and the return of Ant-Man. Behind these big moments, however, there were quite a number of small details that not everyone picked up on. Some of these moments were minor details revealing how particular characters are holding up, while others were actual callbacks to previous movies in the Marvel Cinematic Universe. 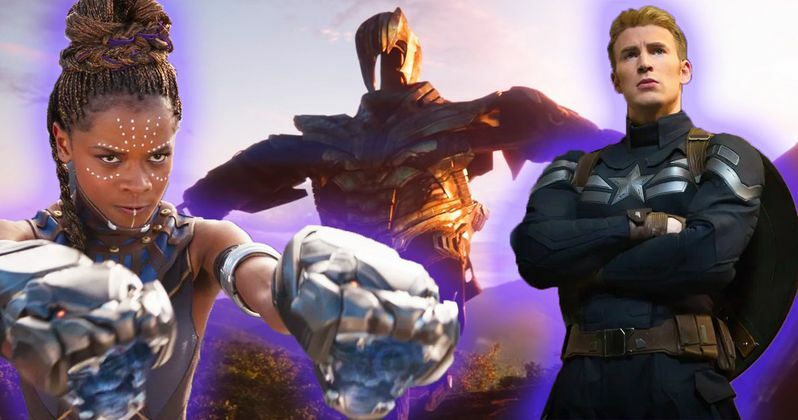 With this in mind, here are 7 details you may have missed in the Avengers 4 trailer. Shuri, the younger sister of T'Challa / Black Panther, did not appear in the final moments of Avengers: Infinity War, leaving her fate a mystery to her fans. When asked about the fate of this beloved character back in May, the movie's directors, Anthony and Joe Russo, neglected to confirm if Shuri lived or died from the snap at the end of the movie. Alas, this new trailer has given us a definitive answer. One of the shots in the Endgame trailer featured a holographic screen showing those who were believed to be lost in the decimation, including Scott Lang and Peter Parker. However, for a brief moment at the beginning of this shot, the face of Shuri is shown being projected, before being replaced by Peter, confirming that she did not survive the Infinity War snap. Many fans were hoping that Shuri would take over as the Queen of Wakanda in T'Challa's absence, but that does not appear to be the case, leaving the political state of Wakanda a mystery. One of the most touching relationships in the MCU is the connection between Gamora and Nebula, the adoptive sisters who were forced to compete together, yet still bonded over their shared struggles. The end of Guardians of the Galaxy Vol. 2 reunited the pair, making it seem as though the two would go on many adventures together to take on Thanos and to stop more innocent souls like themselves from being corrupted. Unfortunately, this was not the case, as Gamora only saw her sister once more before being sacrificed in Infinity War. While Nebula is typically shown being emotionless and uncaring, she has shown some brief sympathy for Gamora in previous movies, and it looks as though Endgame will touch on this quite a bit more. Two different shots in the new trailer featured Nebula looking down at Gamora's seat on the Milano, with one shot even showing Nebula stroking her hand across the chair. While Nebula is typically good at holding her emotions back, it looks like Endgame will finally feature her showing remorse for the loss of the only person who seemed to care about her. Avengers: Age of Ultron throwback. The Endgame trailer opened up with a shot of Tony's hand reaching for his destroyed Iron Man helmet aboard the Milano. While the sight of the destroyed Iron Man helmet was certainly compelling, the movement of Tony's hand was actually a callback to a previous Avengers trailer. Back in 2014, the first teaser for Avengers: Age of Ultron featured an incredibly similar shot towards the beginning, featuring Ultron's metallic hand reaching forward. The shot of Tony's arm is almost a complete mirror of the shot of Ultron's arm, which may actually have some visual symbolism to it. In Avengers: Age of Ultron, Tony created Ultron, who was essentially an evil version of himself, in order to prevent what he described as "the endgame." Now that the "endgame" has started, Tony needs to be his own Ultron (or at least his own version of his original vision of Ultron) in order to undo what has been done. Maybe we are reading too far into this, but the similarity between the two shots is still quite uncanny. Shockingly, the only shot featuring Thanos in the Endgame trailer showed his hand, equipped with the damaged Infinity Gauntlet, skimming along some alien plants, presumably on the farm he was shown at at the end of Infinity War. Like in the comics, it would seem as though Thanos has retired and taken up farming as a hobby for the remainder of his life. However, the way the Russo brothers presented this is quite genius. The shot of Thanos's hand is essentially the spitting image of the popular wheat and grain shot from 2000's Gladiator. Much like Thanos, Maximus from Gladiator only ever wanted to retire on a farm after helping his people. This was often presented by Maximus envisioning himself being back on his family's farm, with almost every vision showing Maximus's hand grazing over the wheat and grain he was growing. It was a soothing shot that always showed Maximus's deepest desire, which is something he never reached. Thanos, on the other hand, has accomplished his goal, and now appears to be in the same amount of peace that Maximus always dreamed of reaching. Over the years, this shot from Gladiator has become quite iconic, creating an immediate emotional parallel for this similar shot in Avengers: Endgame. Thor's new eye isn't sitting well. The ending of Thor: Ragnarok horrified a number of avid Chris Hemsworth fans when the villain Hela tore out Thor's eye, with Thor needing to wear an eyepatch following the final battle. Avengers: Infinity War had an easy fix for Thor's lack of an eye, as Rocket had just happened to have stolen a spare mechanical recently, which he gratefully loaned to Thor during their trip to Nidavellir. Unfortunately, the trailer for Avengers: Endgame has revealed that it may not have been as easy of a fix as we had previously predicted. The only shot of Thor in the trailer features the god of thunder sitting down rather grumpily, with his new eye now looking droopy. It certainly does not look as real as it did at the end of Infinity War. Whether or not this is any representation of the state of his character remains to be seen, but it will be interesting to see the struggles of Thor's empty eye socket return in the next movie. One of Captain America's most beloved suits, the STRIKE Stealth Uniform that was featured in the first half of Captain America: The Winter Soldier, is apparently making a comeback in Avengers: End Game. Toward the end of the trailer, as Captain America and Black Widow appear to be launching their new plan to bring back half of the universe, Cap is shown wearing his stealthy, blue and silver outfit, which he hasn't worn since 2014. While it's possible that the return of this suit may tie-in to Captain America's character development in Avengers: Endgame, it may actually be symbolism for the Russo brothers' journey with Marvel Studios. Captain America: The Winter Soldier was the first Marvel movie to be directed by Anthony and Joe Russo, and Avengers: Endgame appears to be the last movie that they will direct. It would be incredibly nostalgic for this pair of directors to finish their time with Marvel the way that they started it: with Captain America wearing a slick stealth suit as he fights to protect the greater good. One of the highlights of the Endgame trailer was the return of Scott Lang / Ant-Man at the very ending, who has seemingly found a way to escape the Quantum Realm after being trapped inside of it at the end of Ant-Man and the Wasp earlier this year. However, there was a bit more to this surprise return than just Ant-Man himself. In the security camera footage showing Scott at the Avengers' doorstep, a brown van can be seen behind him. This is the very same van that was used by Hank Pym and Janet Van Dyne at the end of Ant-Man and the Wasp, which held their recently designed Quantum Tunnel inside. This pretty much confirms the theories that the Avengers will use Quantum energy in order to defeat Thanos, possibly even using it to travel back in time and reverse the events of Infinity War. Whether or not the movie will actually feature time travel remains to be seen, but surely something will come out of this Quantum power coming into the Avengers' possession. The brevity of the Avengers: Endgame trailer keeps a lot of the movie's details quiet, which is the way it should be, as this is one movie that most Marvel fans will not want spoiled. While we were able to find these small details throughout the course of the trailer, there is surely a whole lot more to unpack from the movie itself. Until then, the details found in this new trailer from Marvel Studios will suffice.